I have been asked to write about my twenty-nine years in Boulder City. I am moving to Austin, Texas where my older daughter, son-in-law and grandson live. Eva and I arrived in Boulder City in September 1980 after travelling the western states looking for a place to settle. Our goal was Tucson but that faded shortly after we drove within sight of the smog and tall buildings that were not there the last time we went through. We picked Boulder City! We found that there was no full service print shop and decided that was to be our game. We opened Boulder Images in October in the “First Western Plaza”. We advertised in the Boulder City News faithfully in every issue until we sold in 1992. The business was slow for a few months but soon we were working long hours and got involved with the Chamber of Commerce, the Rotary Club, our church, Damboree and other organizations. Eva loved the Chamber and I was caught up with Rotary. We were both Presidents of each in1985. When chartered in 1988 we had grown to 32 men and women and I was named the Founder of the Club. I joined the Boulder City Art Guild in 1981 and handled all their printing needs... and I still do! I volunteered to work as the Guild’s Business Manager in 2001 as a part-time venture. It wasn’t long until it became a full-time job, but I have loved every minute of it. I lost Eva in 1999 to Breast Cancer after fighting off Colon Cancer and I won my battle with Bladder Cancer at the same time. That is the only dark side of my 29 years. 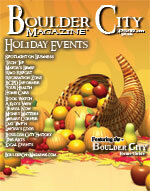 I have enjoyed writing a monthly column in the Boulder City Magazine about the arts in Boulder City for the past few years. Judy Barton, our retired BCHS Art Teacher, will continue the column. Thanks for the memories!